Since before the 13th century, in Icelandic lore, there have been tales of a mythological sea-creature, believed to lurk along the coasts of Norway and Greenland. The Kraken, a legendary monster of large proportions, dangerous tentacles, which rises from the depths of the chilly water with vengeance and an insatiable hunger to devour men and destroy ships without warning. A creature so mysterious and suspect that no clear picture of its origins, appetites, and ways of possible eradication have emerged. Instead, the terrifying myths have expanded out over time and continents, inspiring literature and nightmares for sailors and land-lovers alike. 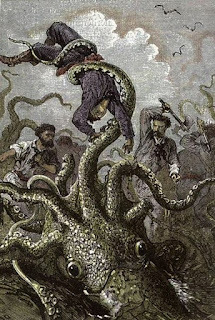 Facing the merciless onslaught of trauma and illness can feel like a Kraken unleashed. Tentacles flailing, battering you in churning, murky waters. Waves whirl-pooling in the wake of the enormity of an altered reality, sucking you under, as you gasp for air amid the overwhelming pressures of drowning. No way to prepare, no adequate way to fight back. Reactionary, instinctual responses to a relentless predator. The dread of the next onslaught looming even larger with each attack, until the moments of potential peace are so wrought with the stress and worry about the next hurdle you get no relief. Like in mythology, in trauma and illness, monsters do exist. They live in compromised immune systems, cancerous cells, altered psyches, damaged organs, diseased bodies, tumors, addictive personalities, abuse, depression, and shattered emotional states. Creatures of the abyss slink back into the darkness, but they do not have to take you with them. You must fight to steal each surviving breath and rage against the tentacles bent on pulling you down. Remember waves do break and clutches loose their grip. The sun rises and the current shifts. There can be calm seas and clear skies again. Have hope. Do not let the Kraken win.